From my previous post, I left you with a sense that I felt guilty for bringing my family to this mountain. 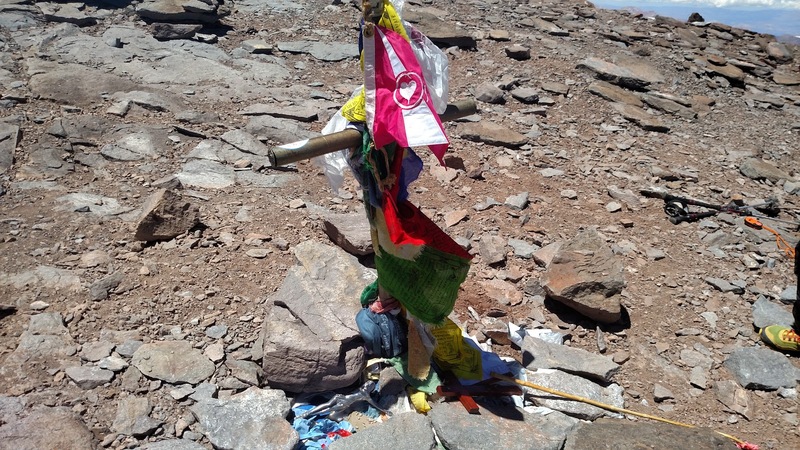 That guilt lingered with me for some time - particularly when I left for acclimatization climbs while they laid around basecamp feeling the full effects of altitude sickness. 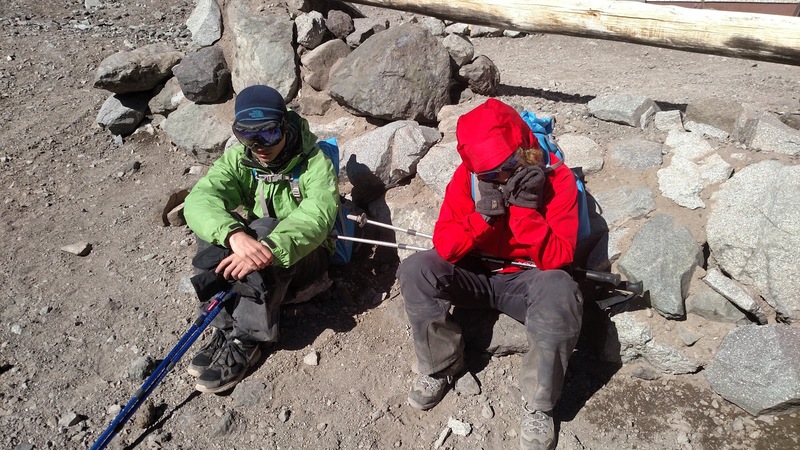 Kathy spent hours laying on the ground in the cook tent trying to sip water and avoid throwing it all up; Patrick was in the same boat but he at least could sit up and converse with the rest of the climbers. Overall, I felt horrible exposing them to this harsh environment. We celebrated Christmas and Patrick's birthday on this mountain and it seemed like a horrendous way to "relax" during the holidays climbing a dusty, scree-infested hill. Oh well, I had to think of the positives. 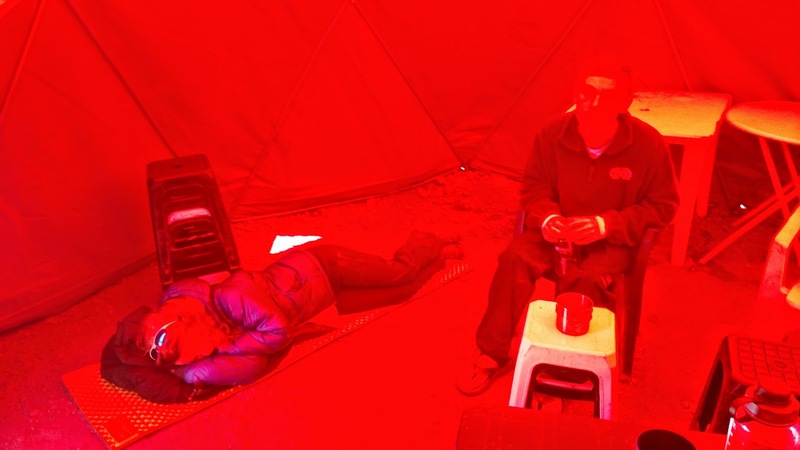 Below is a good red-tinged picture of the cook tent where Kathy is laying down and Patrick is staring blankly ahead wondering when he can head down. It wasn't pretty. Nope, your eyes are working fine. This is the red light of the cook tent that fouled up all our pictures. I still managed to focus on the climb and plan for our summit push. Brendan and I went down to the INKA tent (another service) where they provided free weather forecasts via their WiFi service. Here, we discovered that the weather window was fast-approaching and we had little time to wait. I took a picture of the screen so we could go back to our tent and study our options. The weather forecast for the next few days. Monday (12/29) and Tuesday (12/30) looked promising. We aimed for Monday to be safe. Based upon the weather forecast, we saw a nice weather window open on Monday and Tuesday - three days away from the day we checked (Friday afternoon on 12/26). I was excited for the delay because I wanted us (Brendan and me) to be strong and well-fed. An extra day would ensure our strength and proper hydration on summit day. We talked to Kathy and Patrick about our plans and they said "go for it!" 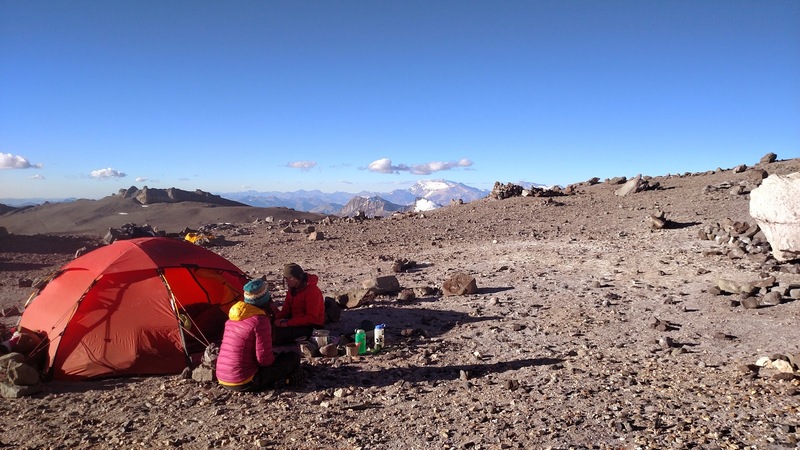 so we planned the next few days and rested while Kathy climbed up to Camp 1 (Canada). 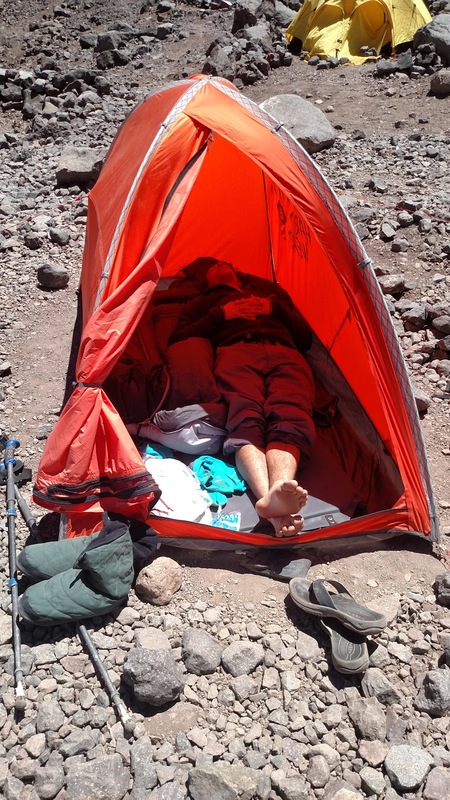 I basked in the sun and enjoyed the rest day after we cached some gear up at Camp 2 the previous day. The day was gorgeous! See the picture below, you can see I had little concern for frostbite. Life at basecamp was rather comfortable. Shorts, t-shirt and flip-flops made for comfy living. Life at basecamp on the rest day was not all that bad. 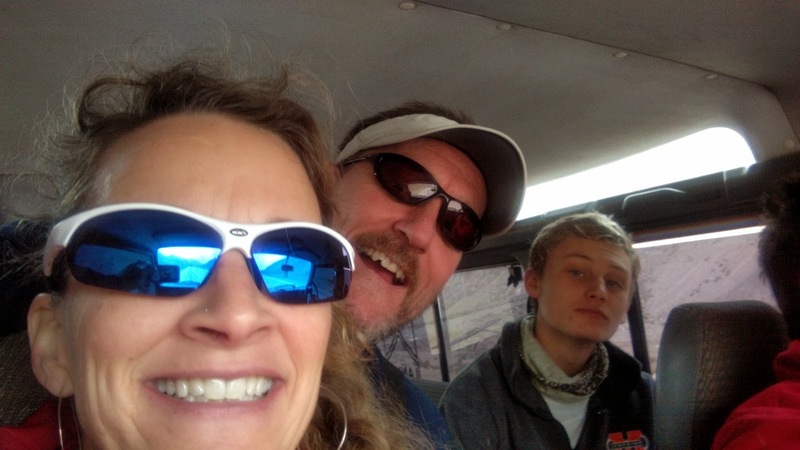 The weather was awesome, Kathy got in a nice acclimatization climb to Camp 1, Patrick walked around basecamp and hung around the cook tent with us trying to battle his continuing nausea. When Kathy returned from her climb, we had an awesome meal and then followed it with a full game of Uno. I can't recall who won but we all had a blast. The red tint inside the tent made it impossible to see the numbers of the yellow cards so that added a nice twist to an already cognitively taxing game. This night was the first I recall that we all felt pretty good. Kathy was on the full mend and Patrick was finally eating and drinking. My guilt as a bad husband/father started to wane. Yeah, I was still lousy but not as bad as I thought yesterday. My family could finally smile. Meanwhile, Brendan and I had little trouble and enjoyed the company at basecamp. Who wouldn't have fun in the mountains - especially when you are with friends/family who laugh most of the time. Uno at basecamp. 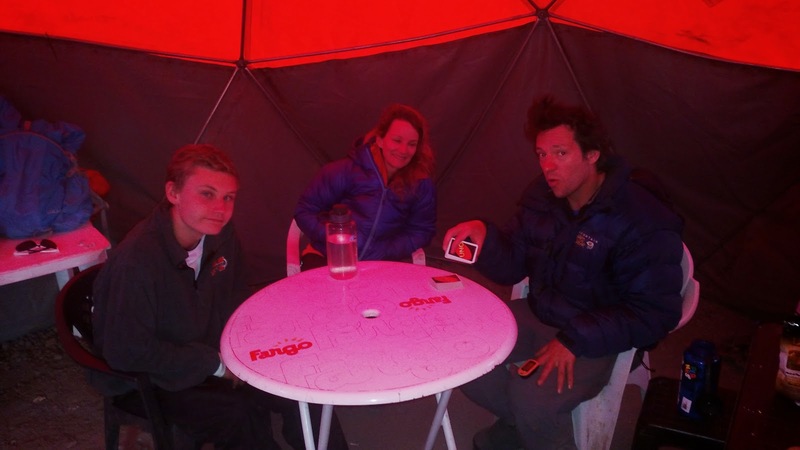 I knew we had two fast-improving climbers when we managed a full game of Uno at 14,900 feet. 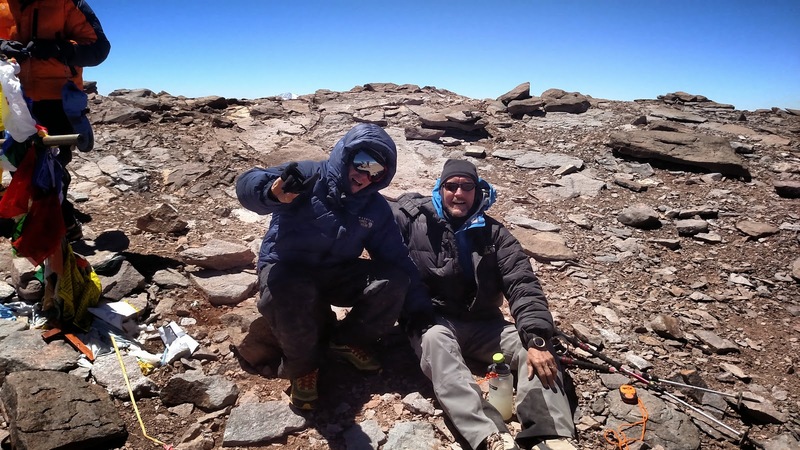 We headed out in the wee hours of the morning toward Camp 2 to begin our summit push. Our agreed-upon departure of 8am came and went after we realized that climbing that early only deprived us of sleep and low-altitude rest. We knew we would make great time to Camp 2 so there was no reason to head out early, get up to Camp 2 early, and then sit around waiting to go to sleep. Instead, we lounged around, got our gear sorted for our next few days, and headed out at a leisurely pace at around 10am. I like mountain life schedules without alarm clocks. 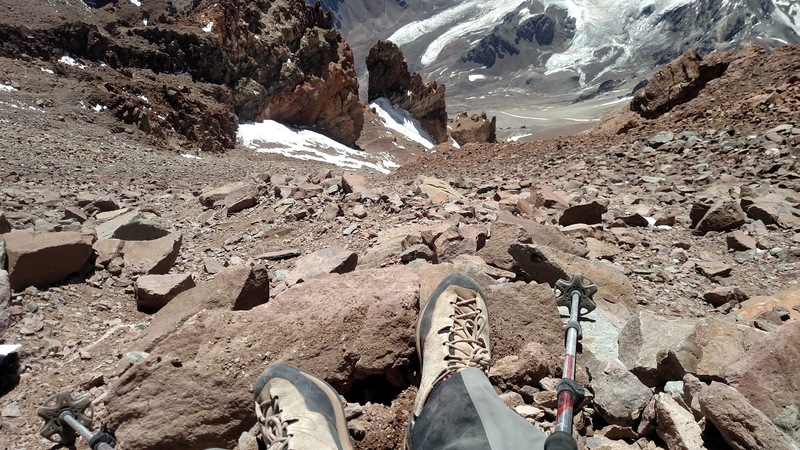 Sometimes early wake-ups are necessary but not on Aconcagua. 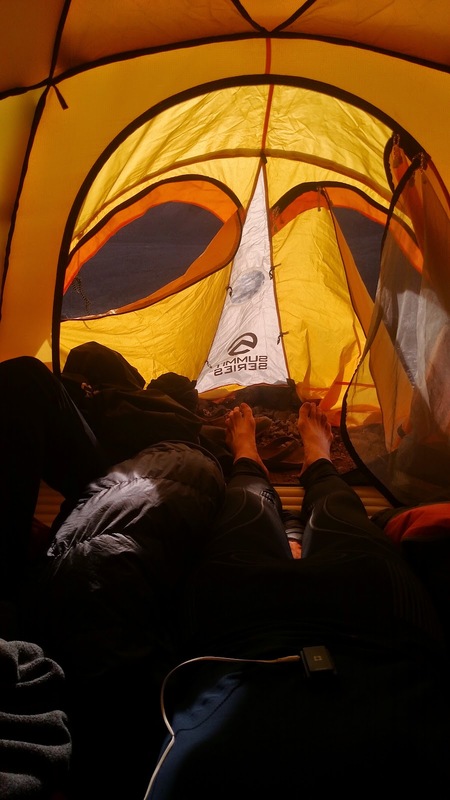 The weather windows allow for later departures and we took full advantage of the opportunities to sleep in when possible; the first day of our summit push was no exception. On our way to the Camp 2 (Nito) to summit in a day or so. Patrick and Kathy managed to occupy themselves on this fine day as well. They headed over to the penitentes, walked around, and snapped a bunch of pictures. Below is Patrick enjoying his walkabout in basecamp. 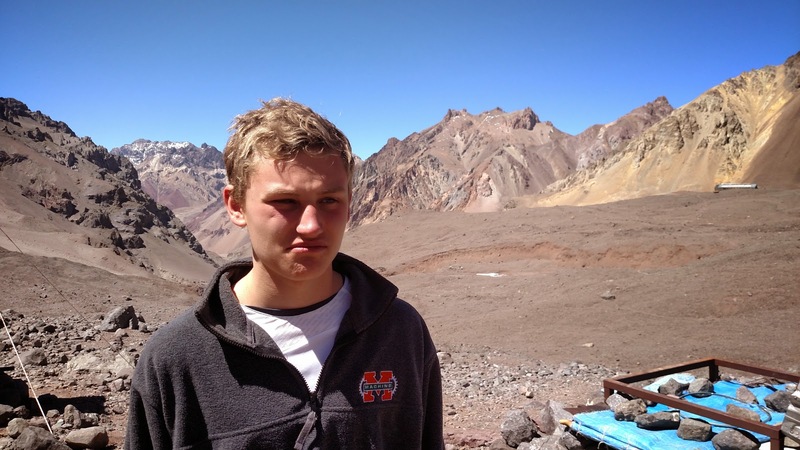 Patrick "enjoying a day hike to the penitentes." The nice weather also allowed us to shed some layers and expose our dusty skin to the sun. As you can see from the picture below, there wasn't much other than dirt, pebbles, and rocks - yep, scree. Damn scree! Now there is one happy climber. He's looking better than yesterday. On the mend! Brendan and I made it to Nito (Camp 2) in a little over 3 hours from basecamp. Instead of taking the switchbacks where everyone else climbed, we took the direct route straight up the hill. There were a few tricky spots but we managed just fine. During our climb up, a porter gal - roughly 4' 10" tall and all muscle - yelled to us that we were going the wrong way. She was crushing the hill while we looked like we were slowly plodding our way up. I had flashbacks of John Candy and Steve Martin and Planes, Trains and Automobiles wondering "how did she know where we were going?" We were focused on decreasing the distance we traveled and, by taking the direct route, we cut off about an hour at least from our climb from PdM to Nito. Upon arrival though, Brendan was feeling the effects of the altitude. He felt great on the cache day previously but today we climbed with a bit more weight in our packs and we made better time than on our cache day. We both felt tired from the long haul but I felt fine after drinking the rest of my water; Brendan still had a lingering headache. I knew he would shake it off. He is one strong dude. The summit push begins. Brendan fighting a headache. Meanwhile, we just learned tomorrow is THE weather window. I walked over to the ranger station to get a weather update. When I got there, I recognized that none of the rangers spoke any English and I speak no Spanish. 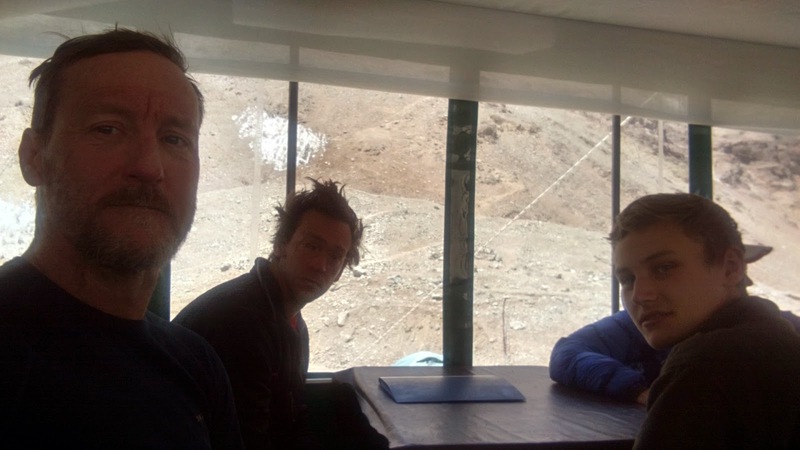 We managed to communicate the essence of "I need a weather forecast for the next few days" and they readily obliged me by writing down the numbers for temperature and wind velocity at the summit. 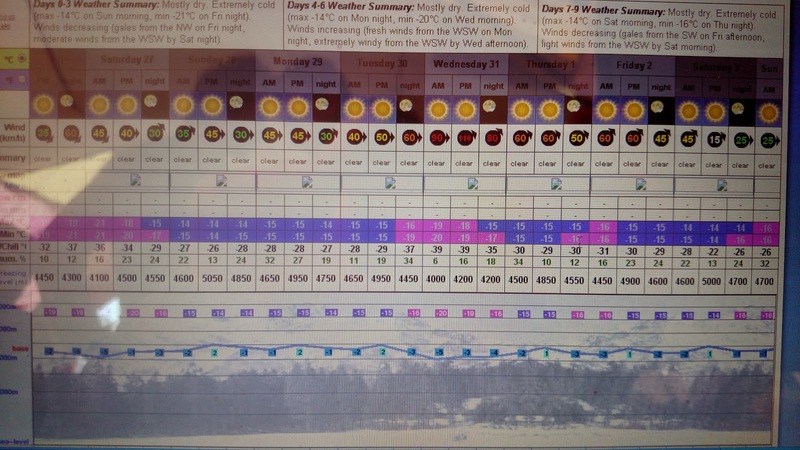 I looked in horror as I saw the only weather window was tomorrow - one or two days before we planned to summit. Horror might be a bit strong but I wanted us both to be strong for summit day and if Brendan were fighting a headache now, he might be best served to spend the day in Nito before making any headway up the hill. AMS can really hold you back so I wanted Brendan to be rested, fed, hydrated, and healthy. He was only missing the last one and an extra day would easily take care of the headache. That extra day was no longer an option. Tomorrow was our summit day and our only summit opportunity for 5-6 days. I walked back to the tent to let Brendan know the news. The good news is that our summit push - and hopefully summit success - would come sooner than expected; the bad news was that it was coming sooner than expected. Brendan told me without hesitation that he would be ready. I had no doubt. Our neighbors at Nito who were discussing their summit options. The weather news spread through camp quickly. 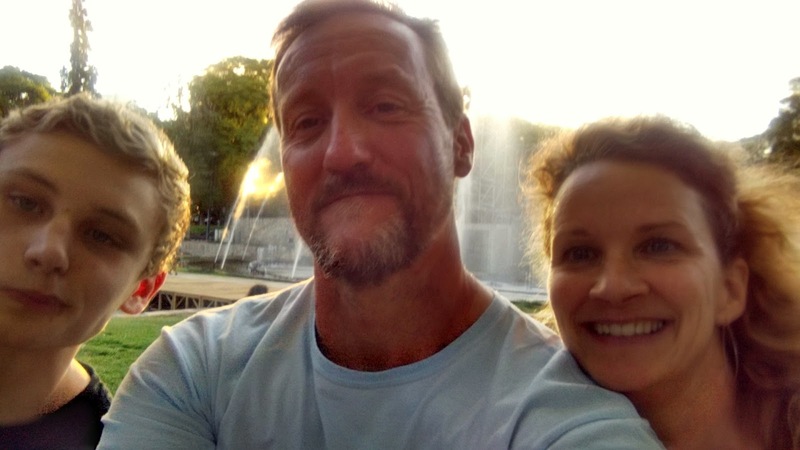 I told our two neighbors (Kallie and Jamie - great people we met during our climb) and they debated the merits of pushing up tomorrow. They had their own struggles on the mountain and pressing up the hill earlier than planned only exacerbates bad situations. Brendan and I had great fortunes so far and I expected that if the weather permitted, we would easily summit. The only thing is the "if" can be really the limiting factor. Weather is so hard to predict on this big mountains. 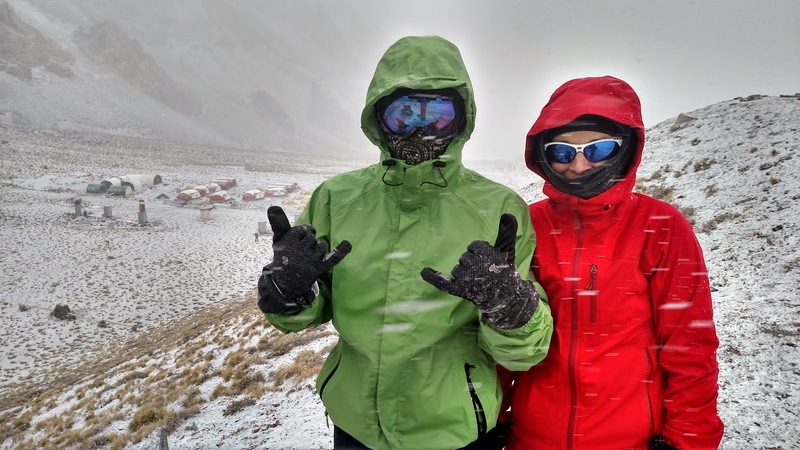 Bad weather can be a lot easier to predict than good weather so we looked to avoid the bad weather by aiming for a summit attempt on a day when it would NOT be blowing 100km/hr at the top. The scree fields were abundant on the climb to the summit. We pushed off at 6:20am - a far cry from our 5am planned departure. Brendan and I both awoke early and saw that the sun had not even risen and we both wanted/needed a little more sleep. I asked him if he felt OK to climb. That night, I decided that if he were not feeling well enough to climb up, I would descend with him and we would wait to summit together. Thankfully, he gave me the thumbs up. That night, Brendan had the mountaineers' breakfast - 4 Tylenol with a chug of water. He was ready and I was relieved. We could climb together and get this hill behind us! So like college kids, we hit the snooze button and drifted off to sleep for another 45 minutes. When we awoke, it was a little chilly and the sun was just rising over the peaks surrounding us. I was ready to get going. Scree and more scree. The little bit of snow allowed us to ditch our mountaineering boots and crampons. The day of climbing began with me lingering behind as usual while Brendan set a blistering pace. I take a while to warm-up - probably about 3 hours - but once I get warmed up, I can climb with anyone. My body just requires more time to warm-up. Brendan was about 200 meters ahead when he stopped and started taking off layers. 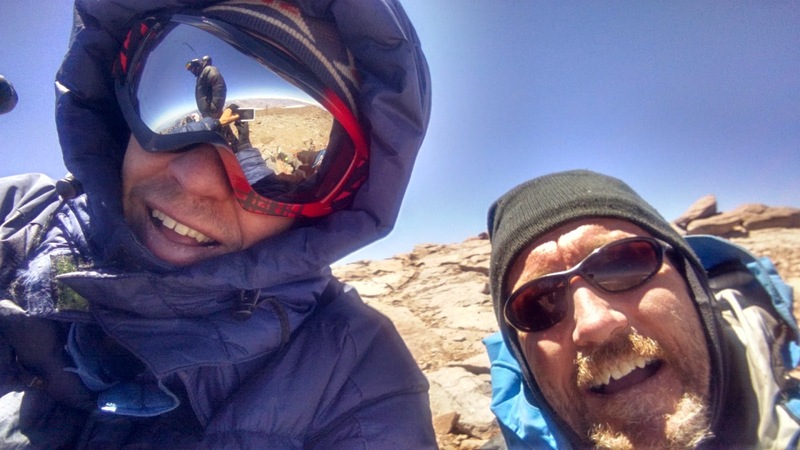 I finally caught up and we chatted for a bit about pacing, timing for the summit, and other plans for equipment. We were both in great spirits. It was great to climb with someone who seemed like he was in a good mood the entire trip. I rarely get in a foul mood and Brendan was a good match for me. We laughed most of the time and took pleasure in the same activities. As you can see from the picture above and below, the entire day seemed like an endless scree field punctuated by a few small icy spots. Because the terrain was mostly scree, we both opted to climb in our approach shoes rather than don our mountaineering boots and crampons. Countless climbers in front of us had these heavy boots on and we were puzzled with they would wear them on a warm day climbing on scree. Yeah, snow, ice, glaciers, etc. 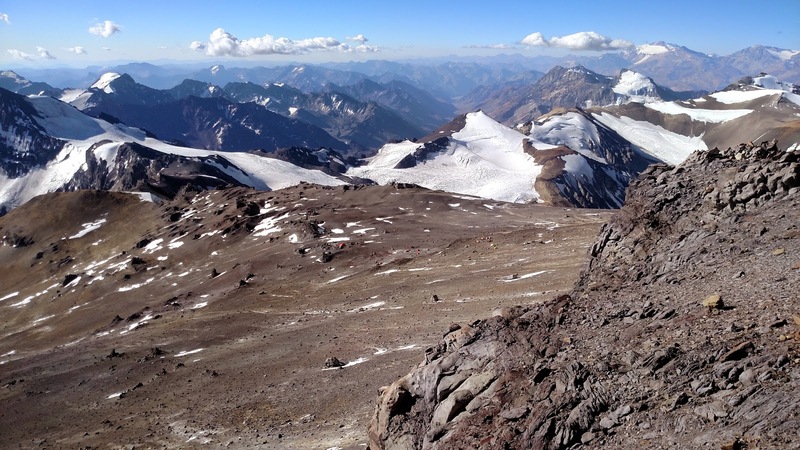 require crampons but dirt, gravel, and rock do not. We passed all those climbers with ease and pressed on toward the summit. Here was the beginning of our struggles. We failed mountaineering 101 today. Crampons would have saved us so much energy. Dummies. We admit it; dumb plan carried out to perfection! One point, however, gave us a hint that crampons might make our lives easier. The picture above shows a small patch of ice/snow that could easily be traversed with crampons. 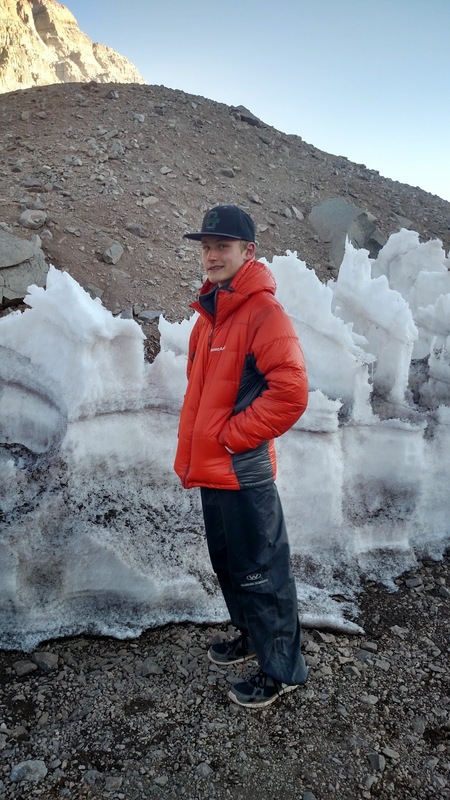 Since we didn't put them on, we had to circumnavigate the ice/snow patch and scale a 60 degree pitch of loose scree that kept sliding beneath our feet. I swear I took 3 steps up for every productive step gained. It was aggravating to say the least but I was happy to see Brendan cursing that pitch when he met me at the top. We both knew we were failing "Mountaineering 101." Crampons would have saved us a ton of time and energy. 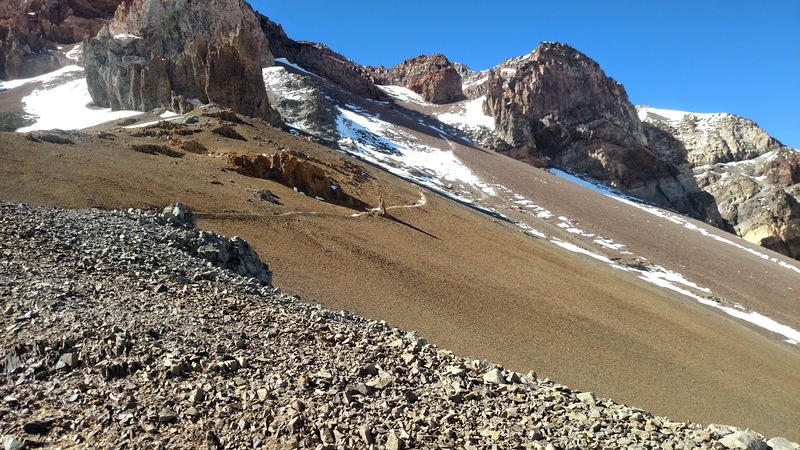 I felt the scree scramble in my legs at 22,000 feet. What a stupid thing for us to do! Olivia summited with me. She kept me strong. Thanks Olivia. After a few hours of scrambling up a rock field that continually slid beneath our feet; the same feet that still only had approach shoes and NOT crampons. We climbed a straight line up a slope of boulders that rolled beneath us and constantly tested our dexterity. Meanwhile, a group of guided climbers were slowly ambling their way up the hill to our right, walking gingerly along an icy path with their crampons holding them fast and steady to the hill. I swear it took them 30 minutes to casually walk up this route while we scrambled furiously up the direct route. A few of these guided climbers were taking a seat every few steps and they still beat us up this route. We were frustrated to say the least. What made matters far worse was that the situation was completely under our control. We cached our boots and crampons lower down the hill so we were completely committed to our approach shoes and couldn't step foot on the icy, slick easy path up to the summit. Again, we were dumb. Guilty as charged. A google enhanced compilation of pictures from the summit. No wind meant I had to hold out the Olivia pennant. We made the summit a full 2 hours+ after we expected. Our expectations were not unreasonable. 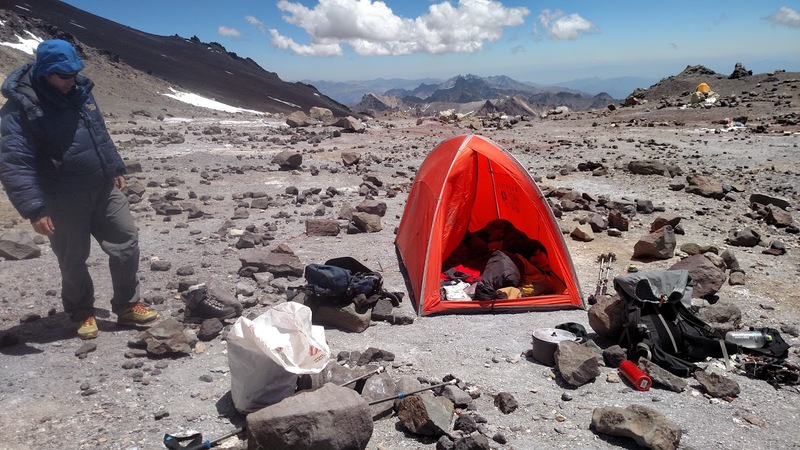 We managed to climb a typical 5-hour route in 3 hours, made Camps 3 and 4 with relative ease in less time than typical for most climbers. Where we were unreasonable was in our expectations for our speed over the landslide prone areas we were forced to scramble up without crampons. What morons. You see the theme here? We were foolish to press on without crampons and only increased our ascent time by hours. Relieved to be on top and off that rock scramble pitch. Oh wait, we gotta go down? Muster up a smile for this selfie. Happy campers on the summit. Do we look tired? If not, we hid it well. "What goes up must come down" and Blood, Sweat and Tears would be a major theme for our descent. We had to descend the scree, rock, and landslide prone areas back to Nito before we could call it a true summit. Remember, the summit is only half-way on an expedition. I was beat. The thought of going back down was not terribly appealing but I was ready to put my body through it all over again as long as I could use gravity to my benefit. Below is the hill we both dreaded. In fact, I even thought about striking this picture from the blog post because it brought back visceral feelings of fatigue and frustration. The picture does not do justice to the pitch of the slope nor to the complexity of the descent along these boulders that constantly moved, slid, and rolled every step down. I was extremely thankful for all the hard workouts that strengthened my ankles. Sorry Brendan for reposting this picture. We will both think about this dreadful hour with the spite it deserves. The scree never ended but at least we could see the Nito (Camp 2) tents from 4,000 feet above. Those tents never seemed to get any closer no matter how long we descended. We made it back to Nito in about 2 hours after the summit - say roughly 5pm. Our summit time was about 3pm and that was at least 2 hours past our estimated 1pm summit time. We were beat when we returned. I just laid down in camp and waited for the sun to go down...or for me to regain some energy so I could crawl into my sleeping bag and sleep through the night. We chatted with our neighbors and they mentioned the expected weather forecast for the next few days. Brendan and I had little food and little interest in spending any more time at Nito so we quickly made the decision to descend to basecamp - leaving at 8pm. Yeah, it was getting dark but we knew we had at least one hour left of sunlight and then about another hour of moonlight to navigate the scree slopes back down. We were both determined so we struck camp, packed up and headed down on our wobbly legs. Nito tents way in the distance. And this picture is more than half-way down the slope. We were almost home! Brendan on the last bit of the descent. We were euphorically speechless when we arrived in Nito. 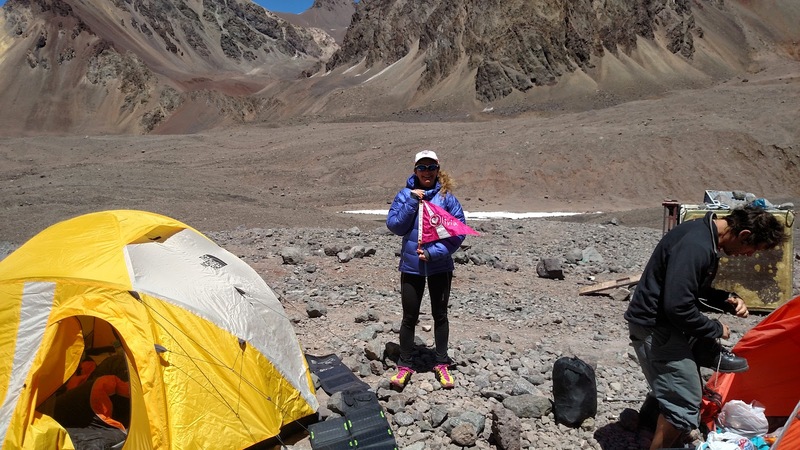 Aconcagua, done! We rolled into PdM at about 10pm - a full 2 hours+ after leaving Nito and a bit longer than it would have taken had we been rested. No matter. We were home and could sleep in the next day. Since we arrived at basecamp so late, nobody was up to greet us. Kathy heard our voices and we soon found a few late-night climbers up and about. Brendan and I were spent. We were climbing for 16+ hours that day and had enough. I sat in the cook tent with a few other new people I hadn't met before telling them about our long day. 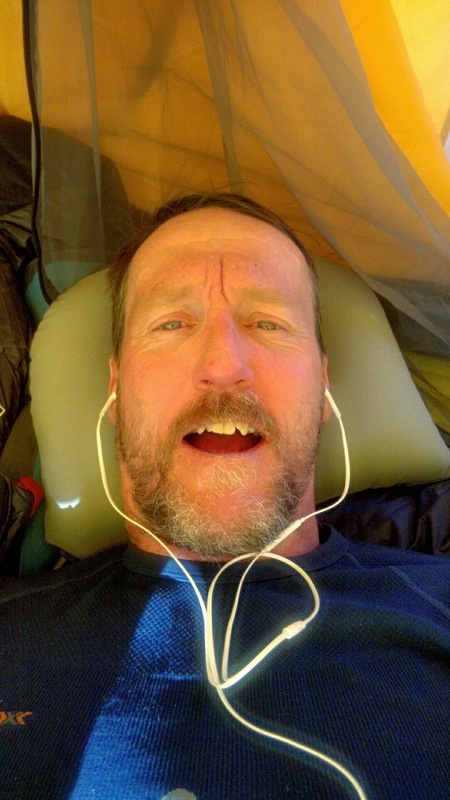 My fatigue probably made me fairly incoherent but I didn't care; I was sitting in basecamp in a comfy chair and could drink some water while I ate the remains of our rations. Tuna fish in a can never tasted so good. Brendan, meanwhile, headed for bed right away. I wanted to eat and drink so I could recover enough and be strong for our retreat the following day (or later). We decided to spend the day recovering from our long summit push and that day proved to be well-earned and much needed. I laid about all day, napping and listening to tunes while Brendan did much the same and Kathy and Patrick puttered about in basecamp. It was a glorious day just like all post-summit days. I had no cares in the world. I just wanted to rest and I took full advantage of the opportunity. 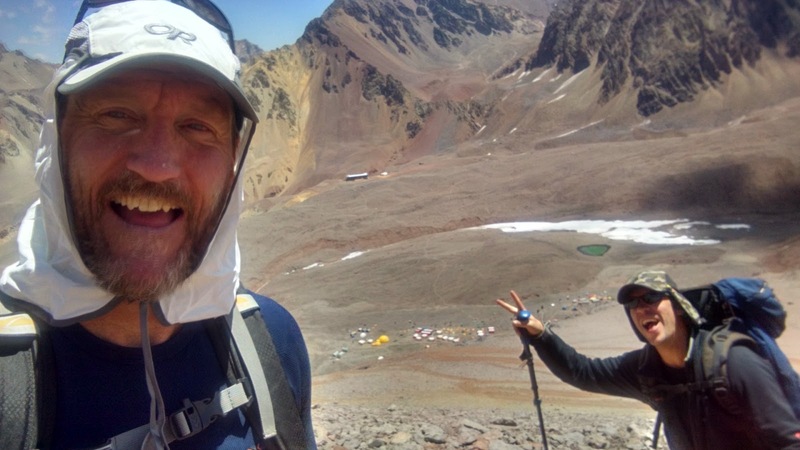 Some friends we met in basecamp - two guys from Argentina - were leaving for the circumnavigation of the mountain rather than ascend to the summit. 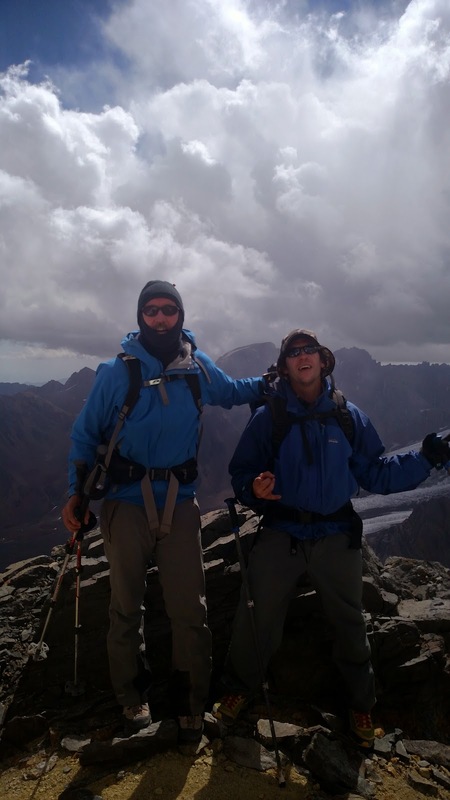 They saw the weather window close on them and opted for climbing higher but safer rather than wait for an uncertain period to attempt the summit. I didn't blame them but they were disappointed. We bid them good luck that next morning and then drifted back to sleep on this lazy day. I got up a few times to grab a picture or two and then headed back to sleep or started packing for our eventual retreat the next day. There were a ton of things to pack but I was in no mood to exert too much energy. Brendan - I am sure - felt the same way. Patrick was in great spirits this fine day because he knew we were leaving soon. I don't blame him. He and Kathy put up with a ton of discomfort. I never experienced AMS or at least not to the extent they experienced it this past week. They were far tougher than I was or probably will ever be on a mountain. I was happy for Patrick that he could finally get down and eat something more to his tastes. Patrick knew the misery was about to end. Speaking of eating, none of us wanted to cook. We were done with our food - not that we ran out but rather we couldn't bear the thought of another meal cooked by us. 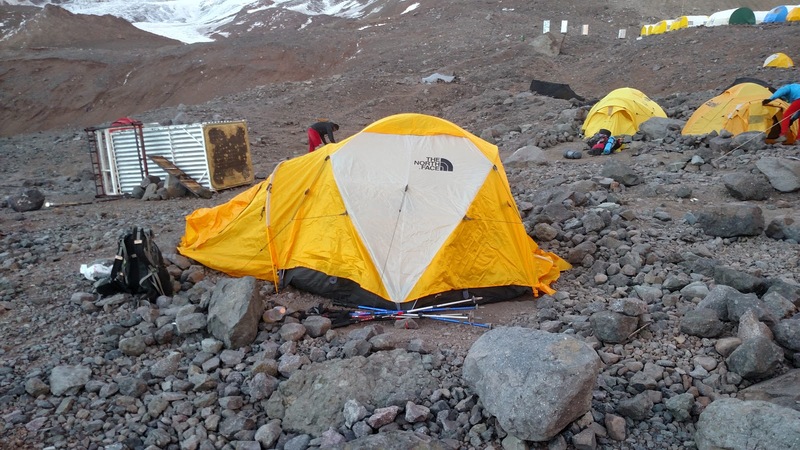 A few climbers told us about this nice tent up the hill in basecamp where you could order a pizza and beer/Coke. Price was not an issue so we went for it. 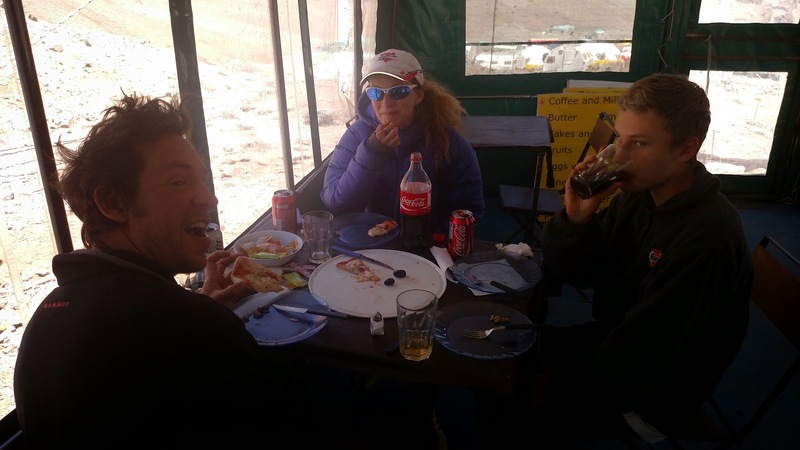 We ordered a beer, Cokes, pizza, and fries and enjoyed the respite from basecamp. It was a small slice of heaven just a mere 100m from our basecamp tents. We were still beat and really hungry. Pizza! Coming up. A real meal at basecamp. We were all done with chicken noodle soup and crackers. Bring on the pizza! The tent that provided us a break from food monotony. Pizza, beer, coke, and fries. What more could a climber ask for after a successful summit? Oh yeah, a bed and shower please. Perhaps a sit-down toilet would be nice too. After eating this amazing meal, we retired back to our tents for more napping and packing. I was ready to leave and, if left to my own devices, I would have shoved off that night and trekked out in the dark. Once I finish the objective, I want to get back to civilization. I was done. Naptime in the tent on a sunny afternoon post-summit. I was rocking out to the Who "Quadrophenia"
Happy guy. Time for a shower soon. In my fifth and final installment, I intend to provide pictures of the trek down and the post-summit party that ensued. We summited on December 28th, 2014 just after 3pm and managed to get back to basecamp at 10pm after a 3-hour rest at Camp 2 (Nito). The next day we hung out at basecamp, rested and packed for our trek out. My next post covers December 30th and later. What I could see before I dozed off. 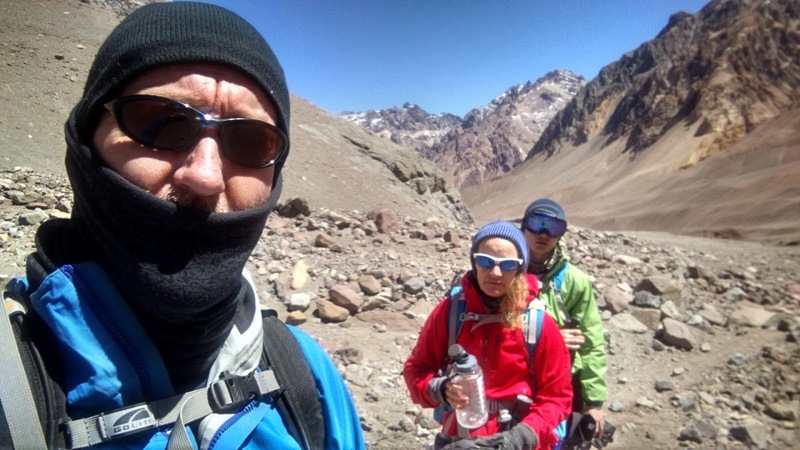 One thing I neglected to post was the news that Patrick and Kathy summited an 18,000+ foot peak on the same day Brendan and I summited Aconcagua. They climbed together but unassisted by anyone else. Once I collect the pictures from them, I will post them with a write-up by their accounts. They deserve a ton of credit for dusting themselves off after a long, 5 day battle with AMS symptoms. I am so proud of them. They were the strongest climbers on summit day; Brendan and I were the dumbest. 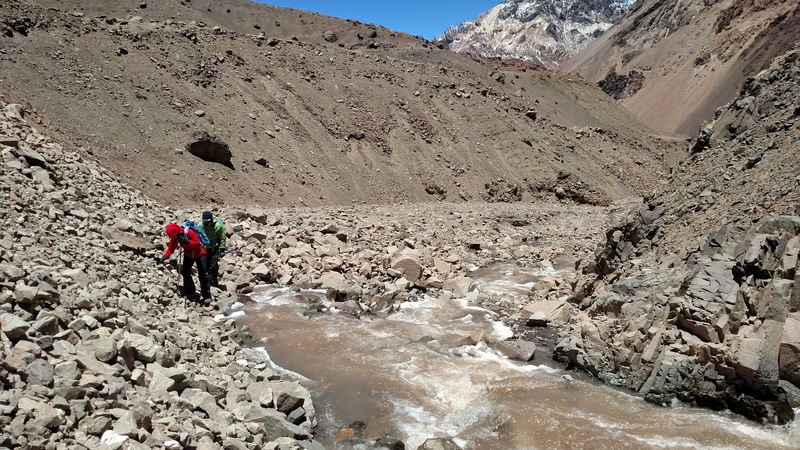 Thanks for following and stay tuned for the exciting conclusion of this Aconcagua trip. 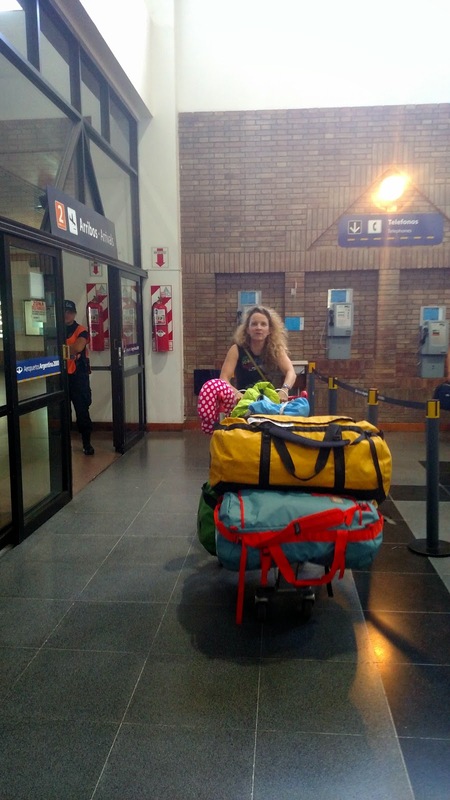 Kat looking relieved to finally arrive in Mendoza; Patrick was nowhere to be found. Great to be with my family. We are in Plaza de Independencia, Mendoza. Me: Can I get a cab to the airport in 10 minutes? 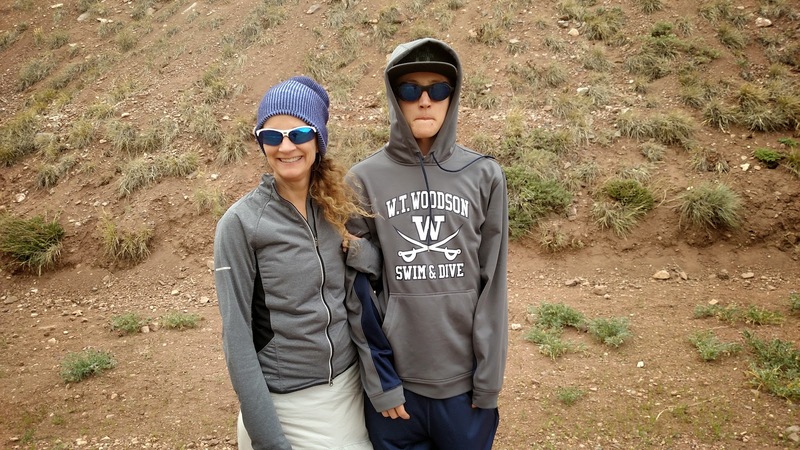 Me: Is it possible to get a permit for our 14-year old son? Picture taken of "Is no possible" man at the permit office. NB: I was extremely angry at this moment. We would not be deterred even by the bureaucratic process Argentina threw at us. 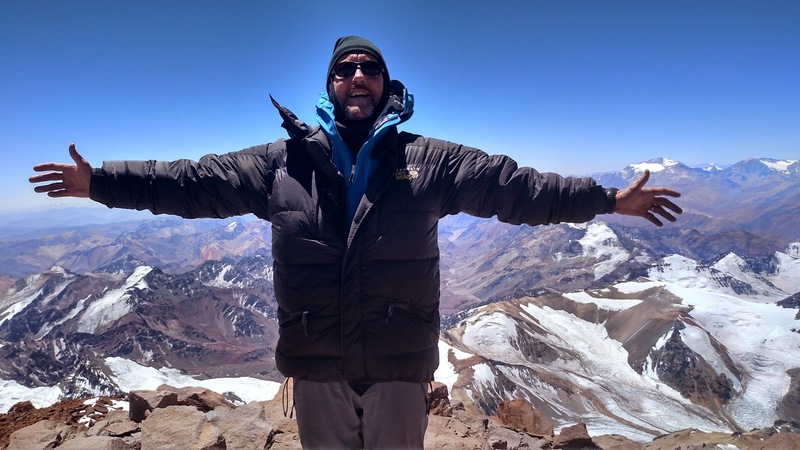 I wanted to climb with my family and no amount of "is no possible" would deter me. Kathy and I left somewhat deflated and certainly irritated. We pressed on. Andrea and Kathy sort out the paperwork while Patrick played on his phone. Thanks to Lanko, we got our permits! OK, a shameless plug that was well-deserved. 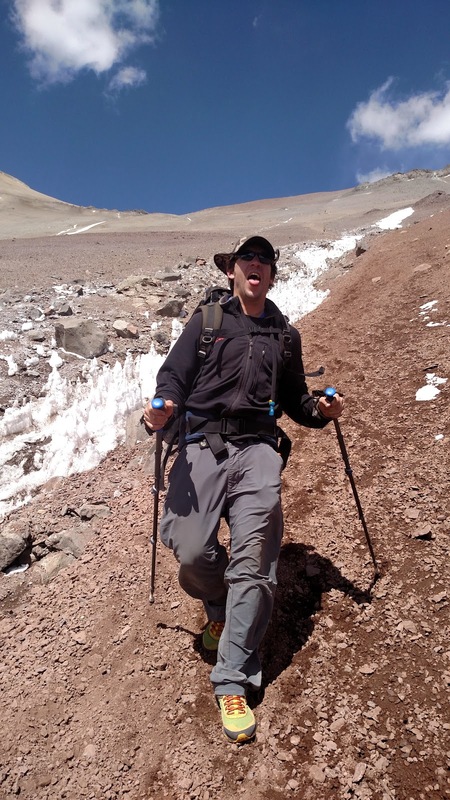 If you have any interest in climbing Aconcagua, I highly recommend you use Lanko for your mule, meal, or tent service. 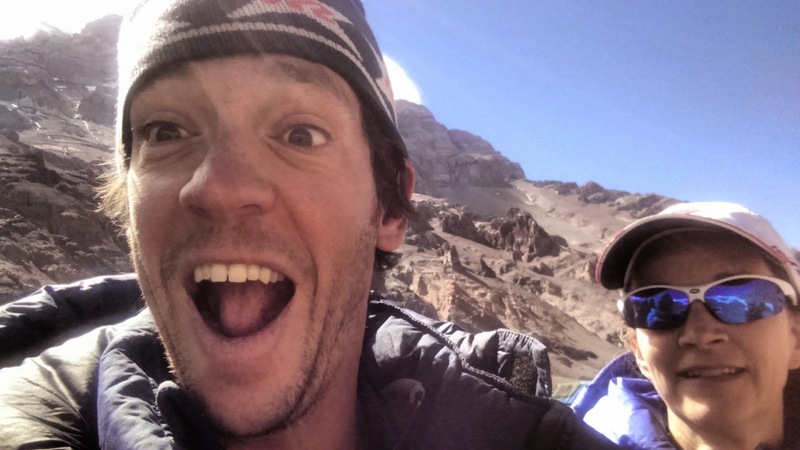 These folks go above and beyond the call of duty to help climbers. We were desperate and the Lanko folks pulled out all the trump cards. They contacted the US Embassy on our behalf, printed out the paperwork, attended some judge ruling on our behalf, and then got us the permits. What a fiasco! Meanwhile, we enjoyed a few great meals with our new friends (thanks to Eduardo and his family for hosting us at their house for a real Argentinian barbeque). Lanko rocks and I thank them from the bottom of my heart for their efforts to get us our permits. 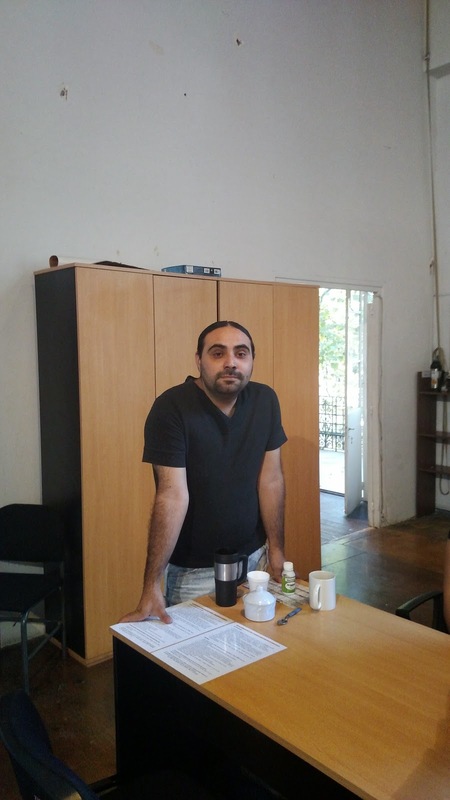 Jose (see picture above) did the initial legwork in Mendoza. Thanks Jose! 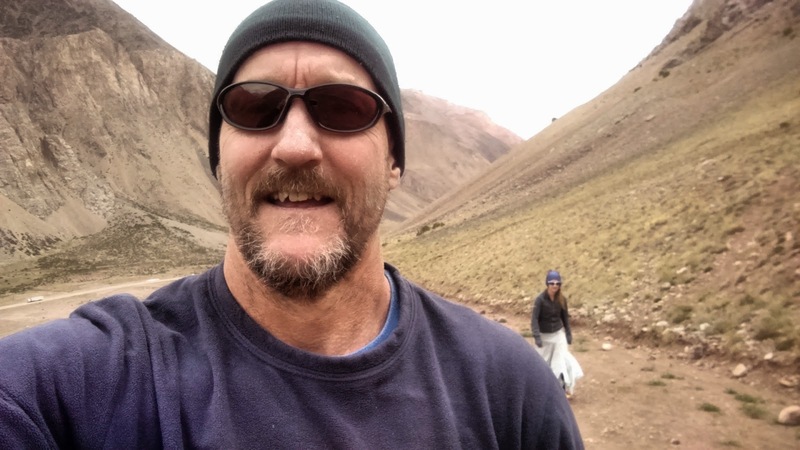 Andrea helped us with the necessary paperwork and walked around Mendoza with us to complete the deal. Eduardo hosted us for lunch and fit us in his hectic schedule to ensure we had a comfortable ride up to Penitentes. Yeah sure, Lanko had something to gain in our services but they helped us through a very challenging process and never asked for anything in return. I plan to repay them by recommending their services to all my friends. So after two days of frustration and fingernail chewing, we were off to Penitentes courtesy of Eduardo and his fine service. Thanks again everyone for your help. We intend to repay you guys with countless recommendations. Our 3-hour trip to Penitentes from Mendoza was easy thanks to Eduardo's excellent service and wonderful conversation. 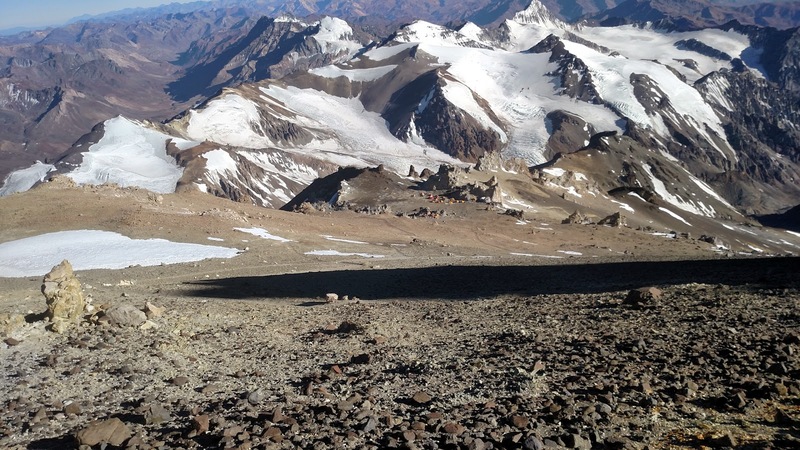 He pointed out all the interesting aspects of the area including the rail service that was no longer maintained by the government (since mid 1970's), the old roads (new, old, and older) connecting Mendoza to Santiago, and last but not least the Inca ruins and trail. Eduardo was an awesome tour guide and his good nature put us all at ease. The accommodations in Penitentes was fantastic. 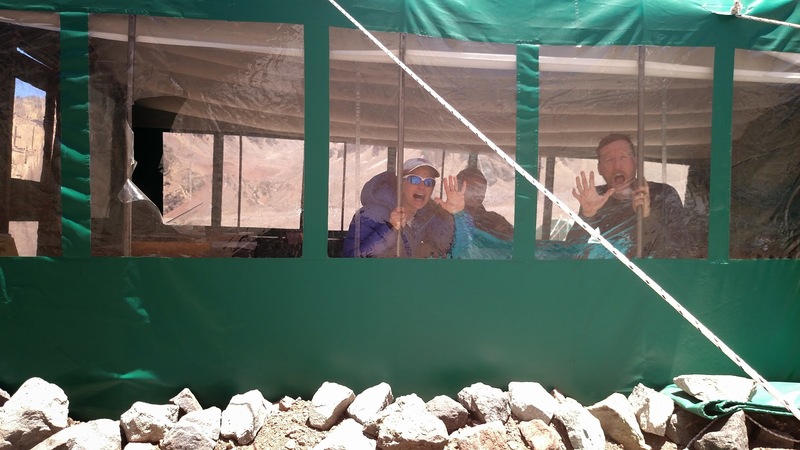 We stayed one night at that altitude because I wanted my family to slowly acclimatize. 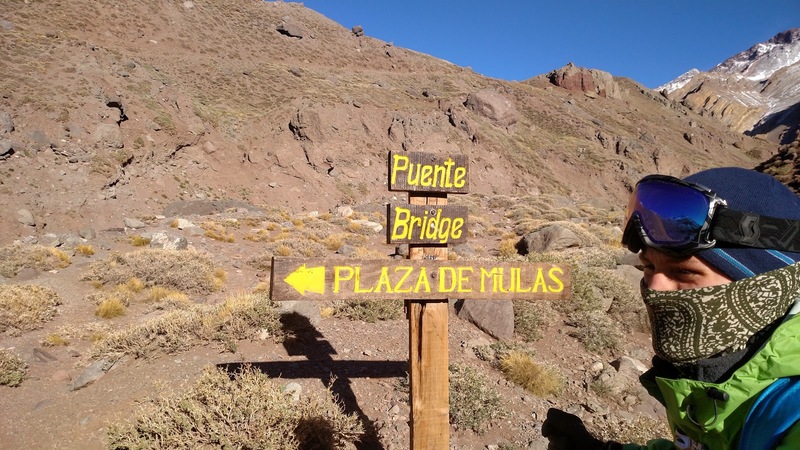 Mendoza is fairly low (3,000 feet or roughly 1 km above sea level) whereas Penitentes is almost 9,000 feet (3 km). 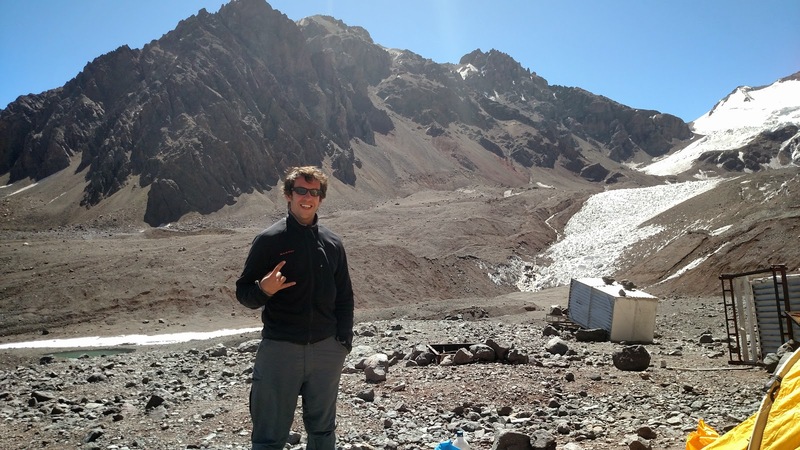 That huge jump made me a little nervous so we spent our time relaxing in a nice refuge away from the hustle of Mendoza. Here we are "relaxing" with the Lanko folks in a friendly game of foosball. 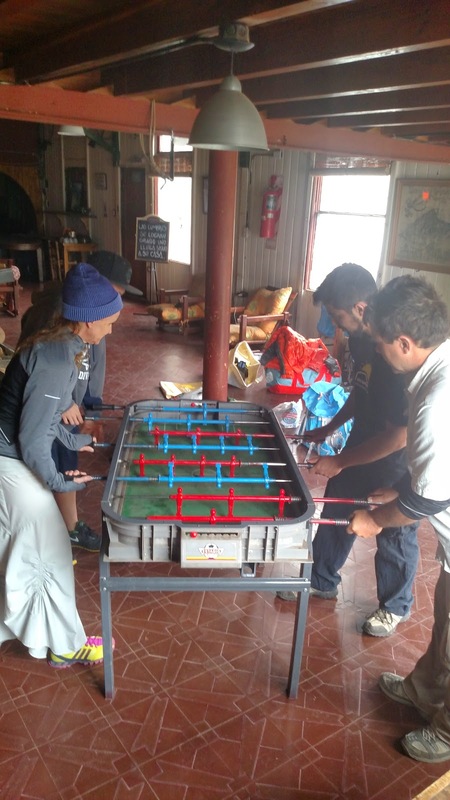 North vs. South in foosball. The McKnights dominated. 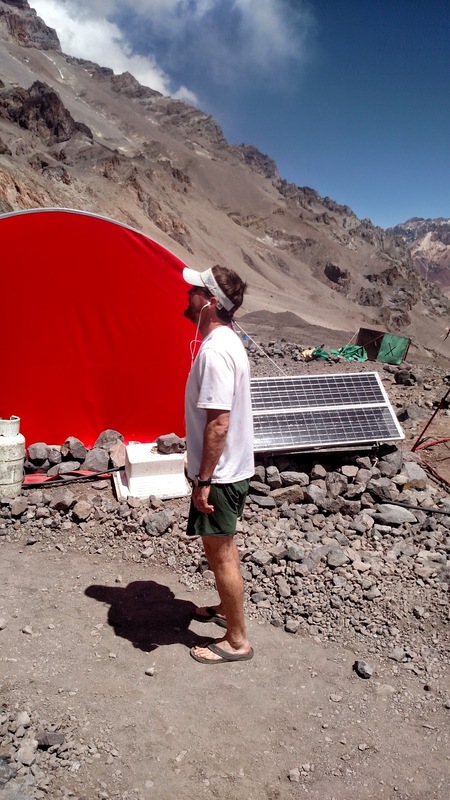 I sat down with my family and explained the whole process of acclimatization. They knew the deal but I wanted to reinforce the process so that they would readily agree to all steps. 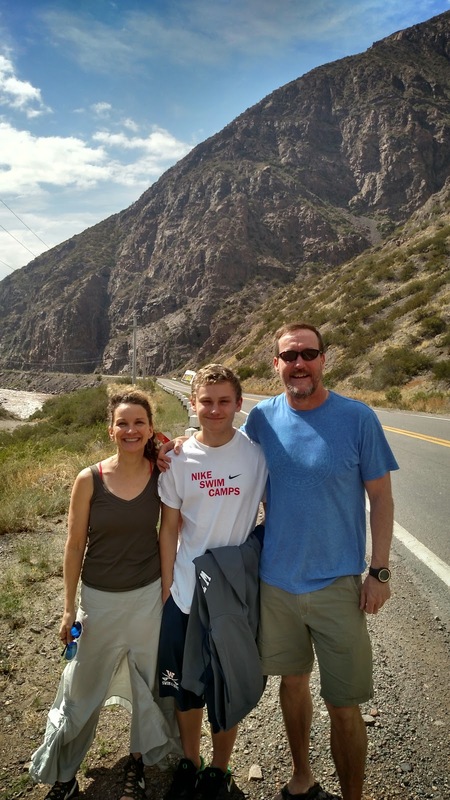 After relaxing in the comfortable confines of the Refuggio Cana de Cruz, we headed up the slopes for a casual acclimatization hike. The hike provided me an opportunity to talk to them about pacing and such for these hikes. I think they readily appreciated the importance of slow hiking since they both felt the altitude. Glad I got them out. My family. You'll never get a smile out of Patrick. Never. We had a great hike and I was impressed that they both could ascend 500 feet without much trouble and navigate the scree with ease. Good job McKnight family! We are off for the Horcones trail head in the morning. Good night. I had a good sense of their pace (slow) during our hike up the ski slopes in Penitentes and wanted to get an early start on the climb to Confluencia. The trek to that first interim camp usually takes about 2 hours and I figured we could make it in about that time - perhaps a bit longer - but I wanted to do it in nice weather. Well, we were all a little slow to pack, repack, unpack, dress, undress, brush teeth, shower, etc. so our departure was much later (1pm) than I scheduled (9am). Regardless, we were all in good spirits. Happy times en route to the Horcones trailhead. Still no smile from Patrick. One is coming, I promise. We had the good fortune of getting a ride from Osvaldo of Lanko. He was so kind to us during our stay and I really appreciated his good nature and kind offerings to my family. Thanks Osvaldo (he got clipped from the photo above but I assure you, that is him driving us). A google enhanced series of pictures of my family in the Confluencia cook tent. Brrrrrr. Yep, snow at Confluencia. 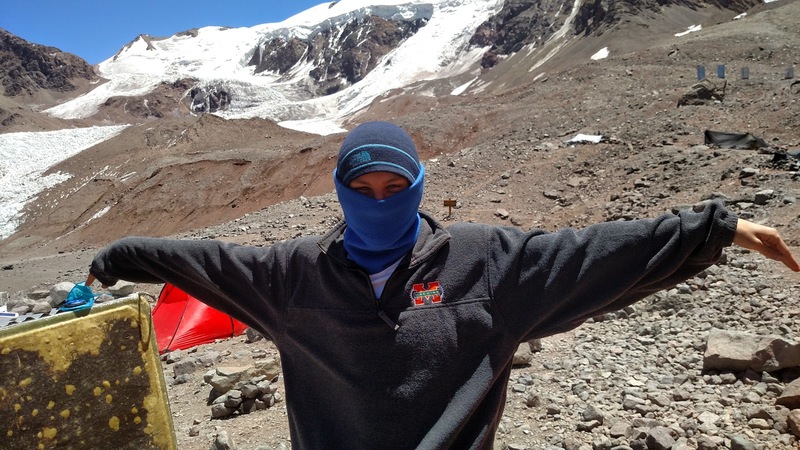 We were ill-prepared for our acclimatization hike but did it! We pushed off after a less-than-stellar morning feeling the chill from the previous night. Fortunately, I had the foresight to ditch our tent and cookware for the trek to PdM - opting for Lanko tent and meal service at Confluencia. That decision saved us from lugging our gear up the long approach to basecamp and also gave us the opportunity to ditch our sleeping bags for the next leg. I rousted the troops early (6am) so we could pack our sleeping bags and any extra unnecessary gear for the trek and give it to the Lanko folks to put on the mules heading up to PdM. 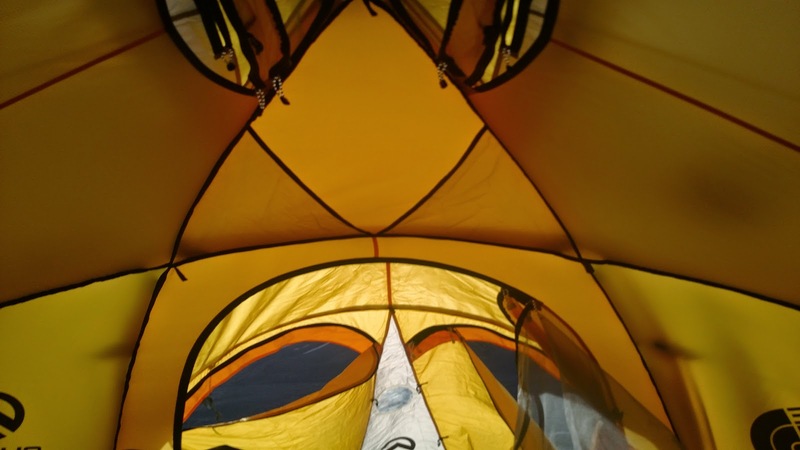 The night in the Lanko tent was memorable for Kat because she slept for about 30 seconds; meanwhile, Patrick and I slept through the maelstrom of snoring provided by all the climbers who surrounded us in the tent. 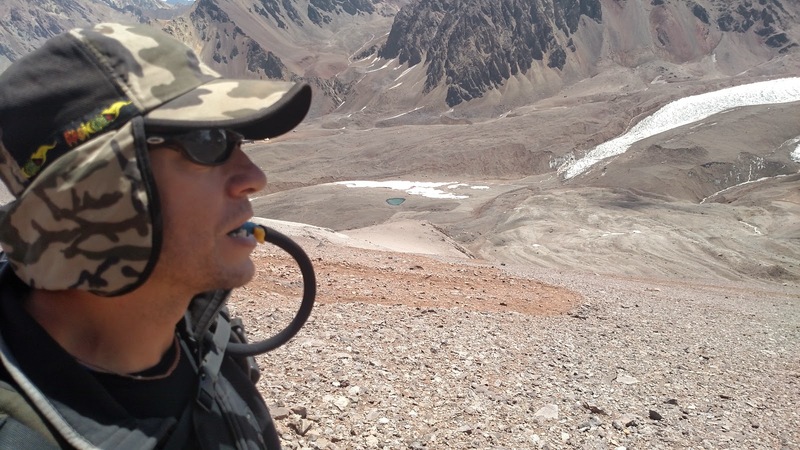 A note to those who climb or aspire to climb: ear plugs are essential climbing gear. Leave your AMEX at home but NEVER leave behind your ear plugs. Patrick and I enjoyed a great night's rest thanks to our 90 db ear plugs; Kat, on the other hand, came out of that mess exhausted. We headed out early - way earlier than the others in camp - after I noted that the trek could take our slow-moving family up to 12 hours. Yep, it is a long trek in and I was worried we might run out of water, food, daylight, and energy before reaching PdM. Patrick charging forward. Only 9 hours to go! Kat thought I was pushing them or pointing out that they were slow but really I was noting that their pace provided me with good ideas about what might be necessary for the rest of the trek. I worried about water and food. Lanko provided us with a bit of extra food after I asked for it. Again, Lanko rocks. We headed out on the long, dusty trail. The going was tough due to the winds and dust storms. I already endured this leg before; the second time was no treat. Damn I hate long, boring approaches. This one was one of the worst I can recall. The nicest part of the trek to PdM was along the creek. We finally got a respite from the dust. I encouraged Kat and Patrick to keep moving, keep drinking, and keep moving. The faster we moved, the quicker this misery would end. Below is where I really appreciated the toughness of my family. They hit the infamous switchbacks just below PdM and they were exhausted. Kat finished her water (see pic below) and Patrick was so tired, I thought he would collapse at any moment. Consider this....we left at 7am and hiked for 6 hours (it is 1pm in the picture below). Each of us had a little lunch and 1.5 liters of water consumed already. The altitude gain was enough already - perhaps 1,000 feet or 300m and the heat was starting to kick in. Patrick's legs were wobbly and Kathy had a raging headache and persistent nausea. All was not good with the McKnight family. Just below the switchbacks to PdM. Not many smiles from Kat and Patrick. I felt fine (sorry family). Just 3 hours later, we reached the top of the switchbacks and walked into basecamp. The troops were exhausted. Kat was barely alive and certainly relieved to be in camp. She felt awful. Right Kat? Those feelings persisted for some time. Patrick was just exhausted. He gave everything he could to get up the switchbacks; he also gave us a vocabulary lesson in newage profanity. Well done Patrick! They got to PdM alright but things were not fine. My work just began. I had to setup camp and get them some food, water, and rest right away. No matter how hard I tried, I had no luck getting them out for a brief acclimatization hike. Tired puppies. I think they both would have fallen asleep here had I let them. I setup the tent and got them inside with plenty of fluids in their warm Nalgene bottles. They were tired and ready to sleep off their long trek. I was ready and rearing to go for more climbing. Instead, I tended to my family and hoped they would shake off the AMS symptoms they both reported when we arrived at PdM. The McKnight household at PdM. Time to get them to sleep. Fast asleep at PdM. Day 1 was tough. Hopefully the AMS symptoms would abate soon. Meanwhile, I wondered when Brendan would show up. He and I chatted at Penitentes on Kat's phone. Apparently, the airline lost his bags so he had to wait for them to arrive before he could climb. I told him to relax or, as Aaron Rodgers would say....R-E-L-A-X. Brendan is always relaxed so I didn't need to spell it out. 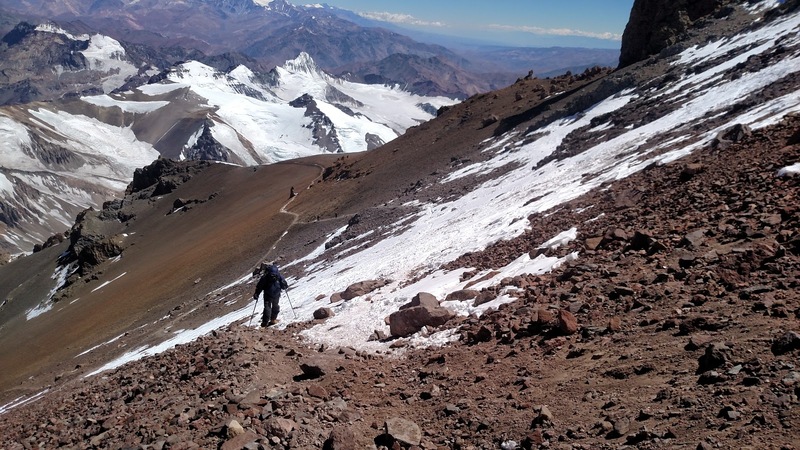 He chilled out in Mendoza and ensured his rapid acclimatization by partying hard with his hostel mates the day before the climb started. Way to go bud! Can't wait to see you soon. I crashed out after a few hours and expected Brendan to arrive in a day or so; for now, I could just sort out the gear, tend to my family, and get in a few acclimatization hikes just to shake out my legs. I woke up late along with my slumbering and ailing family the following day. It was sunny and quite still - a far cry from our trek day yesterday. While sunning myself and sorting through some gear, I looked up to see Brendan stroll into camp. He looked as fresh as fresh could be! Damn was I impressed. Everyone I witnessed walk into camp looked horrible. He was smiling, relaxed, and ready to climb. The climb officially began! Brendan Madden - climbing buddy and great guy. Look how relaxed he looks after his 8-hour trek into PdM. Beast! We hung out the rest of the day and chatted about all sorts of things - actually, mostly climbing. My family struggled the entire day with headaches and nausea while I worried about how horrible a husband/father I was to drag them up this damn scree pile. Why didn't I suggest a vacation at the beach? I could drink beer all day, surf, and sleep. There would be no AMS at the beach. Why climb? Well, I am a lousy surfer - dedicated and interested but lousy - and I hate sitting on the beach. That is why. I like climbing and thought my family would like it too. AMS, however, turns "like" into "hate" really quickly. I watched as my wife curled up into a ball and laid on the floor of the cook tent while my stoic son barely ate or drank of 48 hours. We gave them drugs but they didn't seem to respond well to them. The stress of the situation was building for me but I had my buddy Brendan to help ease the suffering for us all. Brendan and I decided the following day to get out and explore the route. 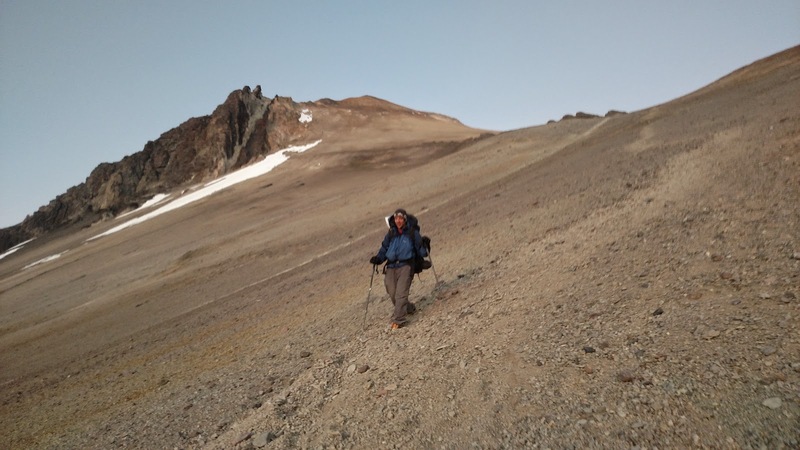 It doesn't take much exploration to realize that the "normal" route is simply a scree field where everyone endures dust, wind, and scree the entire time. We dressed up for the sunny day and headed out. You'll see we assumed roles - I dressed as the "sheik" while Brendan played the role of "redneck." I think we played our parts well. Our hike up the C1 was quick and painless. We both felt great and took tons of pictures. The "sheik" and the "redneck"
The scree never ended nor did the views of brown. On the plus side, I was out there with my friend and we were laughing non-stop. The entire time I was wondering how my family was doing and wondering if I would need to walk them down to Confluencia to recover. Wondering is probably not the right term - perhaps worrying is more appropriate. I worried about their states and figured their climbs were over. What I did not know is if those AMS symptoms were worse than I feared. Let's hope not. Brendan: "hey, when does the scree end?" Me: "never"
Despite the worries, I enjoyed my day on the scree slopes with my pal. Like I said before, we laughed a ton and talked about climbing and other adventures. Brendan is a hoot! Still having fun, right Brendan? We did have fun both up and down that day. 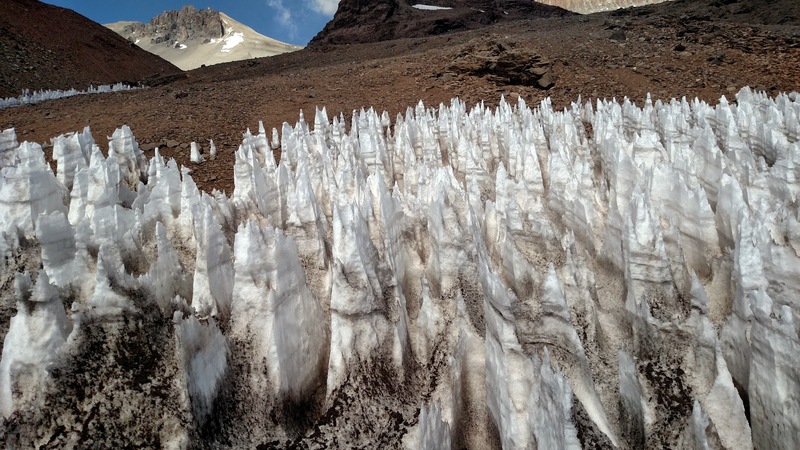 Below, you'll see Brendan going through the penitentes and then another picture of these strange formations up close. Penitentes up close and person. Cool, eh? 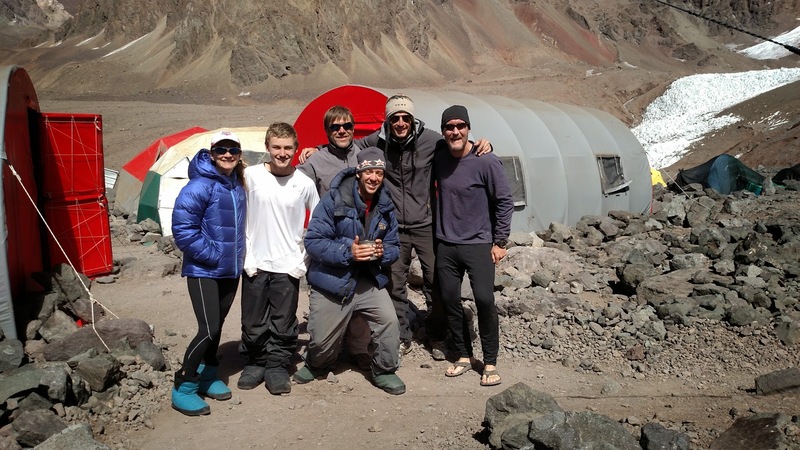 Upon our return to basecamp, we found Patrick up and about talking with some fellow climbers. Brendan and I celebrated a great first day together. Kathy (pictured below behind our new friend Eric) was not feeling well at all. 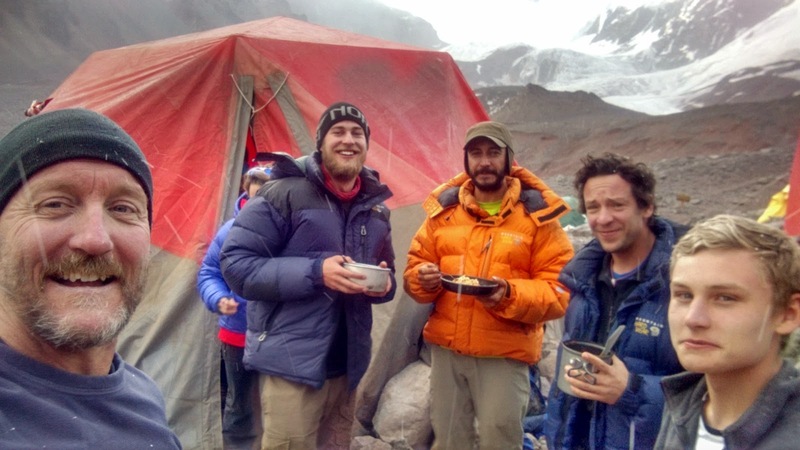 We ate with some fellow climbers (Eric and Kevin) and chatted up a storm. Life was good for some at basecamp but not for all. The story gets more complicated so stay tuned for my next recap. I was worried but happy that at least Patrick seemed to be rebounding from the AMS symptoms. Kathy couldn't hold anything down now and I started to really worry. More later....(tomorrow).